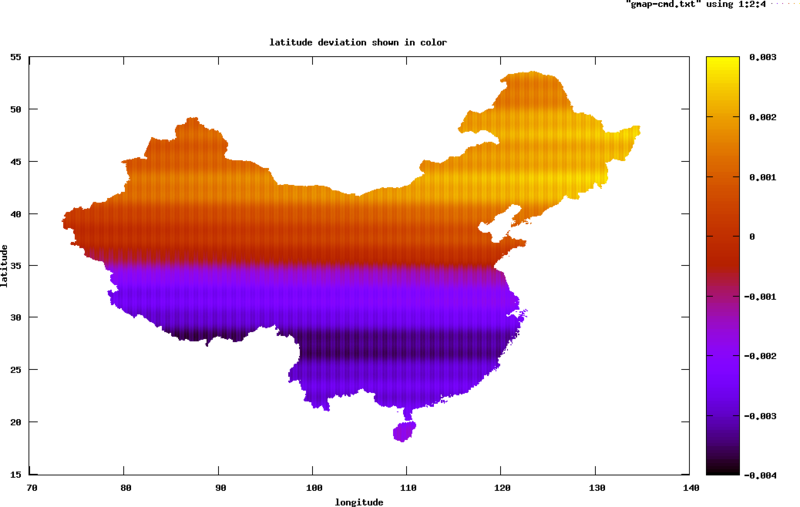 All published maps of China are deviated. 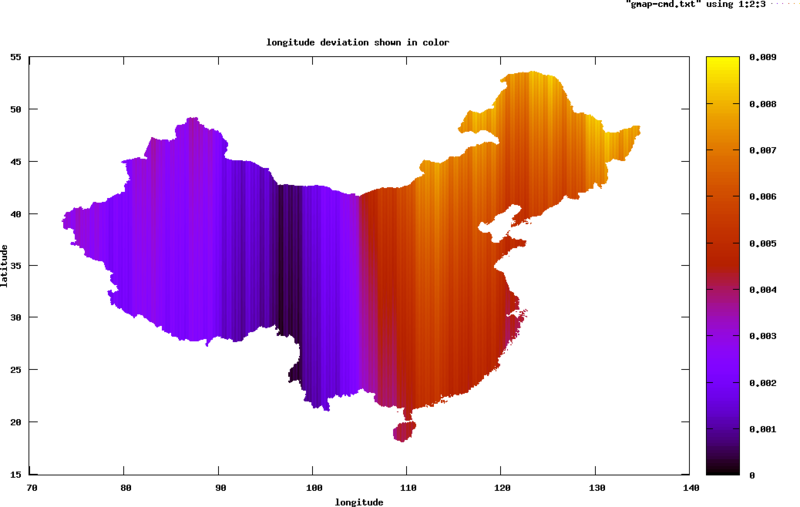 GPS devices sold in China are modified to give the same deviated coordinates. If you don’t know, you may read here, here, here or here. Fortunately, the same deviation algorithm is applied on all maps I have seen, including Garmin (unistrong in China) GPS maps, mapabc.com, Google Maps/Earth. The algorithm is secrete and is only accessible by authority and companies such as garmin and google. Needless to say, this is very annoying for GPS users. Many individuals tried to discover the deviation algorithm by GPS measurement and correlation and found the algorithm to be not only nonlinear but very complicated to describe. With enough sample data, we should be able to get a regression function, which, should resemble the deviation algorithm. I’m not good at regression so I’m putting up all my data and hope someone can help out. It can be downloaded from here. 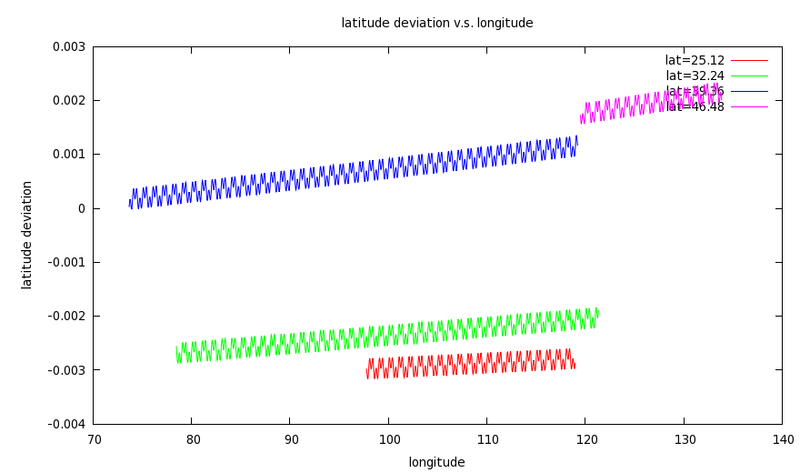 The format is very simple: four fields (longitude, latitude, longitude deviation and latitude deviation) separated by tab. 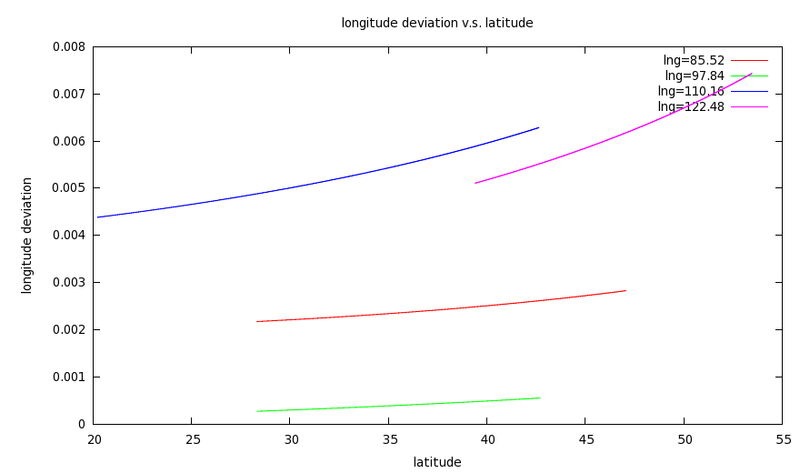 Longitude deviation means (deviated_longitude – true_longitude). The points are sampled with 0.025 degree separation, i.e. 40 samples per degree. There are 1529737 points (lines of text) in the file. Only points in mainland China are available. Figure 1 and 2 shows an overview of the data. There is another file, which contains samples from 8 selected lines (4 west-east, 4 south-north). The sample resolution is higher (200 samples per degree). It is used to plot Figure 3-6. I think it’s helpful for regression analysis. 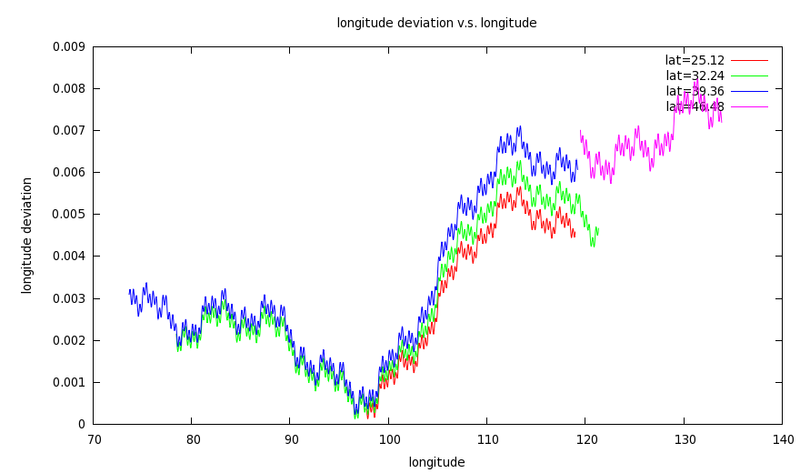 The longitude deviation is always positive (deviate to the east). The maximum is 0.0085562 degree. 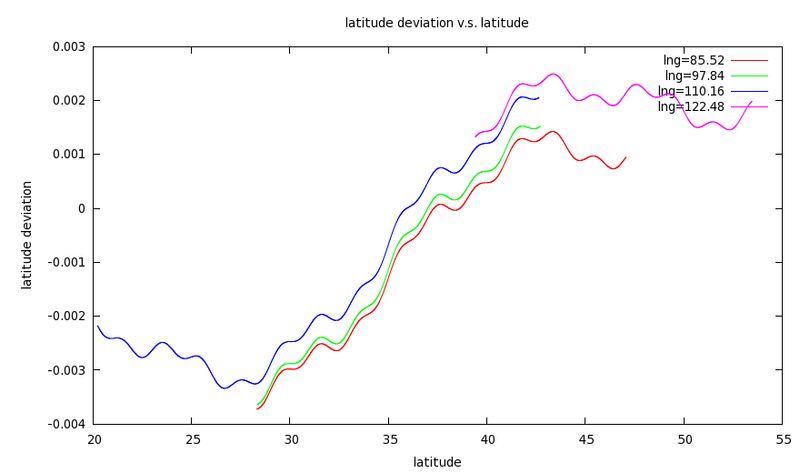 The latitude deviation ranges from -0.0038542 (to the south) to +0.0028230 (to the north) degree. Fig. 4. looks simple. You may think it’s f(x)=b*sin(a*x) + b*sin(3*a*x) + c*x + d. You are wrong. There are other small components. I suggest using fourier transform, but I’m not good at it. This entry was posted on 2010/01/22 at 7:38 pm and is filed under GPS. You can follow any responses to this entry through the RSS 2.0 feed. You can leave a response, or trackback from your own site. did you have any success with findining the right function? Good to see the first reply after 1.5 years. No, not yet. Thank you for the unlocking tool. It works perfect on Mac. Thanks for ‘gimgtools’. An fascinating piece of work! Do you know if Is there is a way to convert NT formated maps into in editable format? Hi Versender, I’m not aware of any, but I’m definitely interested in it. Thank you for providing all the data, it has been extremely useful. Good to see my data being useful. I have also done some research on the regression function, but haven’t got time to publish it. I will defiantly check your code and maybe refer to it. I have been surfing online more than three hours today, but I by no means discovered any fascinating article like yours. Seems this problem has been perfectly solved. https://on4wp7.codeplex.com/SourceControl/changeset/view/21483#353936 Comparing my solution and this one, I missed the square root component. Great work! I’ve been wondering for this stuff two yrs ago when my girlfriend went to China for work and sent me places she visited. Watching Google Maps I noticed that sattelite view doesn’t correspond street view and it was a problem. I then found ditu.google.cn and there wasn’t that deviation, but that site didnt have option “photograps”… So now it all seems to be clear except how can i use google maps without deviation? We need new transform algorithm !!! I guess spatial regression rather than conventional regression because location matters in this case. OLS will not be enough. By the way, where did you get these two datasets, the google link that has expired?